An open access introductory textbook in formal logic. It covers translation, proofs, and formal semantics for sentential and predicate logic. P.D. 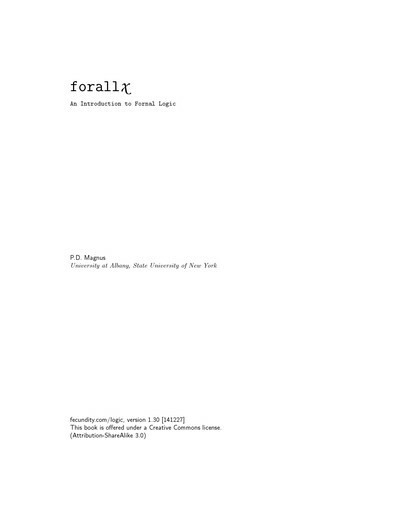 Magnum wrote:forall x is an introduction to sentential logic and first-order predicate logic with identity, logical systems that significantly influenced twentieth-century analytic philosophy. After working through the material in this book, a student should be able to understand most quantified expressions that arise in their philosophical reading. This books treats symbolization, formal semantics, and proof theory for each language. The discussion of formal semantics is more direct than in many introductory texts. Although forall x does not contain proofs of soundness and completeness, it lays the groundwork for understanding why these are things that need to be proven. Throughout the book, I have tried to highlight the choices involved in developing sentential and predicate logic. Students should realize that these two are not the only possible formal languages. In translating to a formal language, we simplify and profit in clarity. The simplification comes at a cost, and different formal languages are suited to translating different parts of natural language. The book is designed to provide a semester's worth of material for an introductory college course. It would be possible to use the book only for sentential logic, by skipping chapters 4-5 and parts of chapter 6. P.D. 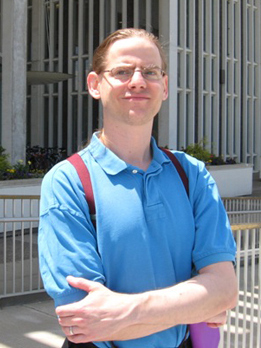 Magnus (@news4wombats) is Professor and Department Chair in the Department of Philosophy at the University at Albany. His primary research is in the philosophy of science, motivated by a fallibilist but non-sceptical conception of scientific knowledge. He has published on underdetermination, scientific realism, and natural kinds; also on related issues in the history of philosophy, social epistemology, and art ontology. He is the author of Scientific Enquiry and Natural Kinds: From Planets to Mallards (2012) as well as dozens of articles. A complete list of his publications is available on his website.